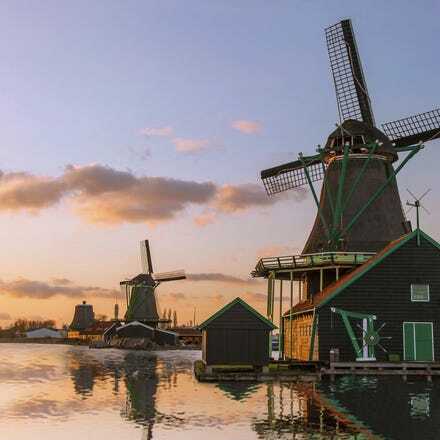 Fly from Dublin to Amsterdam with Aer Lingus and explore the sights and sounds of the Dutch capital for less. Although perhaps known best for its 17th- century canals and energetic nightlife, Amsterdam has many attractions; world-famous museums, UNESCO World Heritage Listed sites, one of Europe's most important financial centres and of course, that iconic café culture. 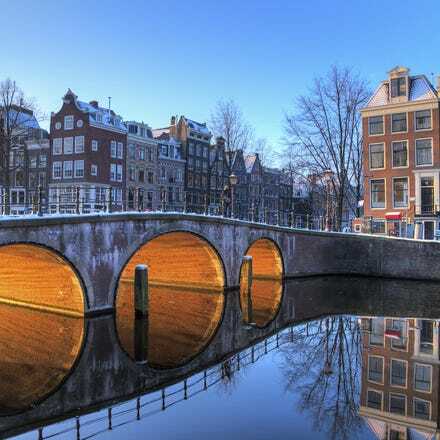 See it all for yourself when you book flights from Dublin to Amsterdam with Aer Lingus. Grab yourself a cheap flight to Amsterdam and discover how easy it is to travel to Europe with Aer Lingus. With regular flights throughout the day from Dublin Airport’s Terminal 2, there will be a flight time to suit your travel needs. Save even more time by checking in online up to 30 hours in advance – and once you touch down at Terminal 2 of Amsterdam Schiphol Airport, simply jump on one of the regular trains to the city centre from the airport, or take advantage of great car rental discounts with our travel partners. With its characteristic canals (UNESCO World Heritage) surrounded by narrow, low and crooked 17th-century houses, Amsterdam is, without a doubt, one of the most charming capital cities in Europe. With a rich cultural life and a wide range of entertainment, Amsterdam is a full-scale city which has managed to retain its small-town feel. Amsterdam is also a real treat for art-lovers. Amsterdam is home to over 50 museums, many of them famous across the globe. Highlights include the Rijksmuseum, Van Gogh Museum and the Stedelijk Museum. For the visitors who have already seen the beautiful canals pioneered the Jordaan and got the hang of our never-ending nightlife..there is plenty more to experience and explore. The Amsterdam Metropolitan Area offers a great variety of surprising and unusual attractions and landscapes. There's something special about Amsterdam in the autumn. As the trees lining the ancient canals turn rich shades of red and gold and the sprawling Vondelpark transforms into a spectacular sea of colours, the city takes on the new season in style. Located at the Visitor Information Centre in Schiphol Airport (Holland Tourist Information), Arrivals 2, Schiphol Plaza. Address: Noord-Zuid Hollands Koffiehuis, Stationsplein 10 (across from Central Station). Amsterdam Airport Schiphol is the main international airport of the Netherlands, and is located just over five miles from Amsterdam. In terms of passenger traffic, it’s one of Europe’s busiest airports. It’s modern, easy to get around and full of shops where you can pass the time. There are 250 worldwide destinations served by 90 airlines departing from this airport. The cheapest way to get to Amsterdam city centre from the airport is by train, which you catch directly below the airport. The journey to Central Station takes around 20 minutes, with trains departing at least every 15 minutes. You can grab a ticket at the NS service desk or ticket machines. If you’d prefer to take a taxi, a journey to the city centre costs roughly €42 and will take around half an hour, depending on traffic. As a heavily populated city, Amsterdam is served well by public transport. If you’re arriving by car, why not try one of the park and ride sites on the outskirts of the city? That way you won’t need to hunt for a parking space once in the centre (and you will most definitely save money). There are 16 tram lines, 55 bus routes, five ferry connections (which are free) and four metro lines in Amsterdam, all transporting you to several destinations with ease. For convenience, you can buy a 24/48/72/96 OV chip card from GVB, Amsterdam's public transport company. This will grant you access to transport on all GVB lines (including night buses). You can either pick one up at GVB Tickets & Info, at a tourist information office, or from a driver or conductor on the trams and buses (though the latter only sell 1-hour and 24-hour disposable cards). Fares are subject to terms, conditions and availability.